For the first time in my life, our family bought into a CSA (Community Supported Agriculture) share this summer. What this means is every week we go to the farm to pick up our produce. The amount and variety we get depends on the crops that week. It's been a delicious (and nutritious) way to eat a variety of local veggies. When the summer harvest started to come in - leafy greens were the first to sprout up for consumption, are still in abundance and should last right up until the first chill of fall hits. While I love to eat greens in a delicious salad, wilted with fresh garlic and olive oil, atop a flatbread or pizza or whirled up in a smoothie - sometimes there are just more greens than I can handle! This is where I started to rely on Pesto as a diverse way to use up my leafy greens and fresh herbs. Plus, it adds so much flavor to all sorts of dishes, and will give me access to farm-fresh greens in the dead of winter since it freezes great! Pesto offers a potent source of micro and macro-nutrients. 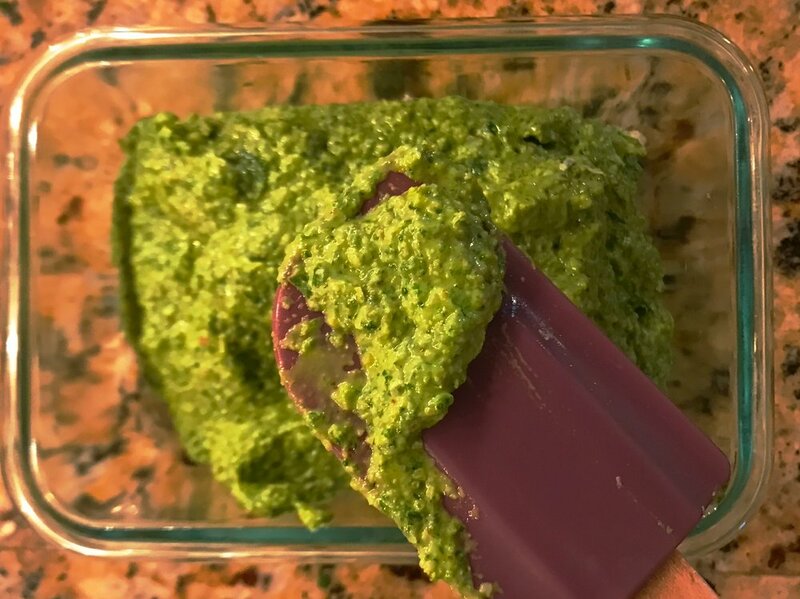 Similar to a green juice or my super-nutrient soup, pesto takes a relatively large amount of produce and blends it down into a concentrated spread. It will soothe inflammation, support immunity and detoxification via the inclusion of fresh lemon and garlic. The olive oil provides a healthy fat that also reduces inflammation, assists in nutrient absorption and supports hormone balance. Basil is known to support mood and lift the spirits, and depending on which greens you choose Pesto be considered an herbal food fit to support a variety of ailments. But, most important, it's a simple way to enjoy greens that taste great. Below is the basic recipe I've been using to make pesto's all summer long - and you can shift any of the ingredients to alter the flavor or use up surplus of whatever leafy green you have on hand. Just keep in mind that more pungent greens - like Sorrel, Arugula or Dandelion - will impart a stronger and more distinct flavor to your pesto (not necessarily a "bad" thing, just might be more spicy or bitter and won't taste like traditional pesto!). When using nettle, be sure to lightly wilt it so the prickles go away. My favorite way to enjoy Pesto is a generous scoop on my morning eggs, melted into zucchini noodles or as a dip for seed-crackers or carrot sticks. Enjoy this baseline recipe and please report back on any creations you fall in love with! Add Leafy Greens and Garlic to the bowl of a food processor. Pulse until uniformly chopped. Add the Lemon Juice and Salt pulse again. With the food processor running, slowly pour in the olive oil until fully combined. Add the Nuts and Cheese (if using) and pulse to incorporate. What monthly inspiration and recipes delivered to your inbox? Please sign up below!